For my office’s Thanksgiving grazing day, the company provided ham and turkey and each person in the office signed up to bring food to share. I volunteered to bring a side dish to go with the ham and turkey. Not sure exactly what to bring, I searched the Whole Foods iPad app for inspiration. 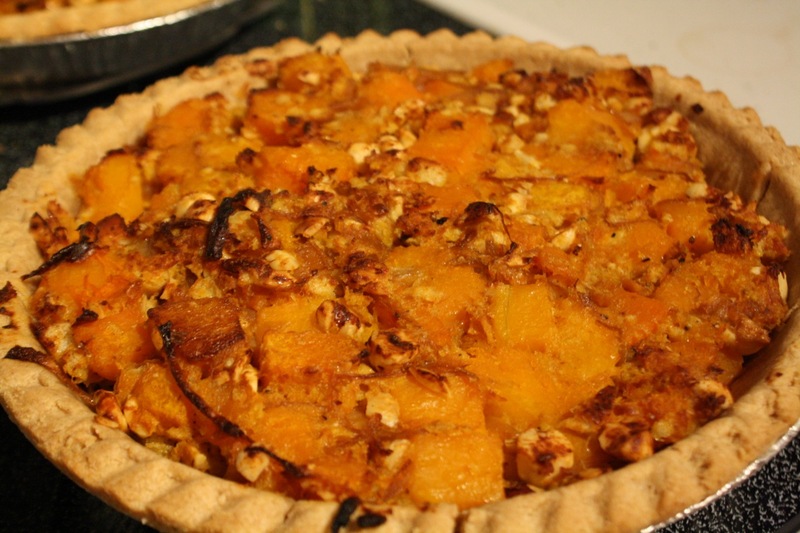 The recipe for Savory Butternut Squash Pie with Hazelntuts caught my eye. I really like savory pies, like this tomato pie, as well as butternut squash. I checked and the recipe is also available on the Whole Foods website. 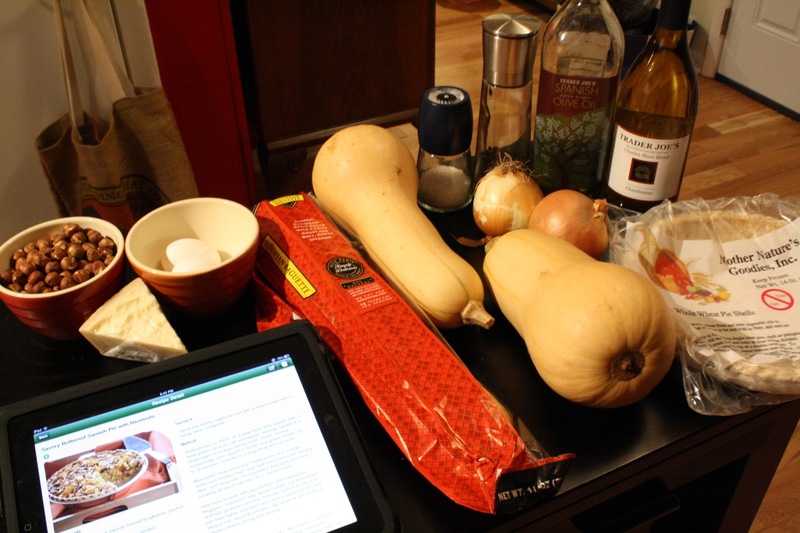 The recipe calls for butternut squash to be cubed, coated in olive oil, and roasted. 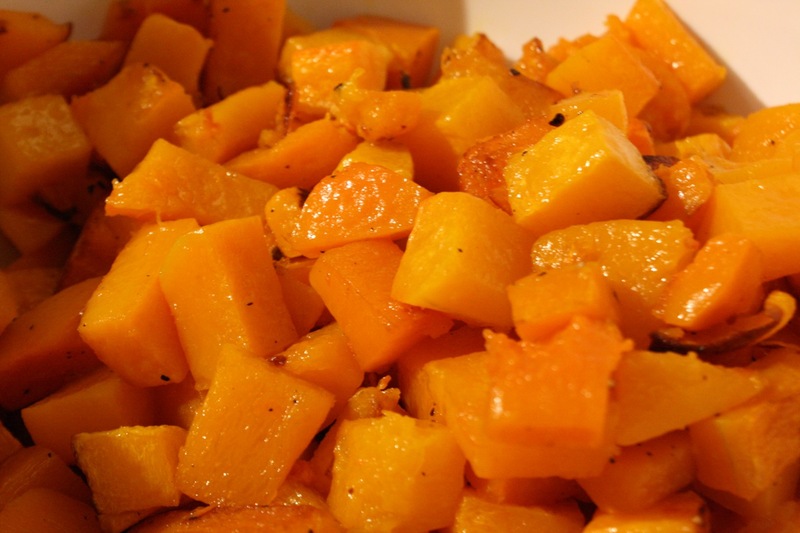 With the sweet earthiness that that develops as butternut squash roasts, I use roasted butternut squash for the base of many Fall inspired meals. 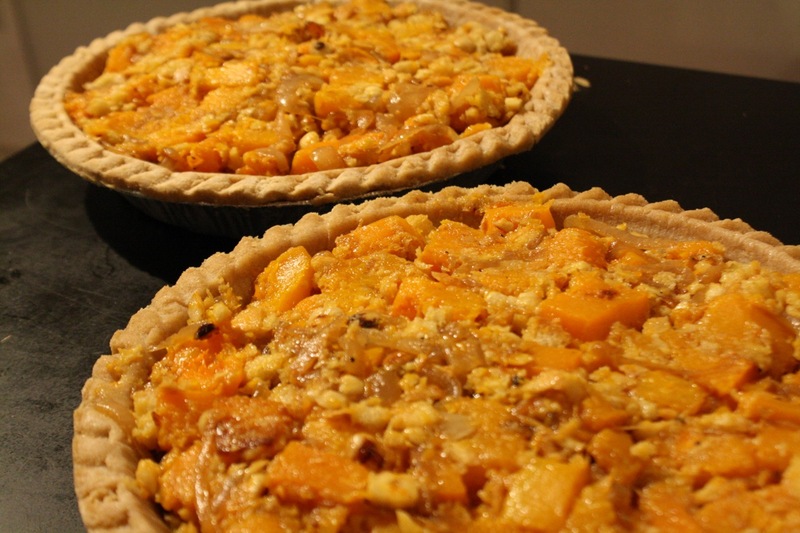 Like in the tomato pie recipe, this Savory Butternut Squash Pie also calles for caramelized onions. 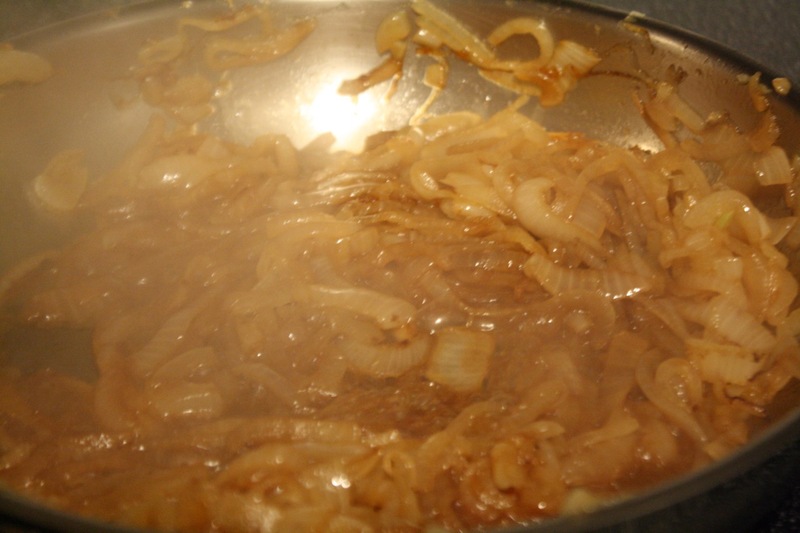 After cooking the onions down, a little white wine is used to deglaze the pan. The aroma released from the onions and the deglazing of the pan is wonderful. Hazelnuts are added to provide a crunch to an otherwise soft pie. I toasted the hazelnuts in a pan until the skins loosened. 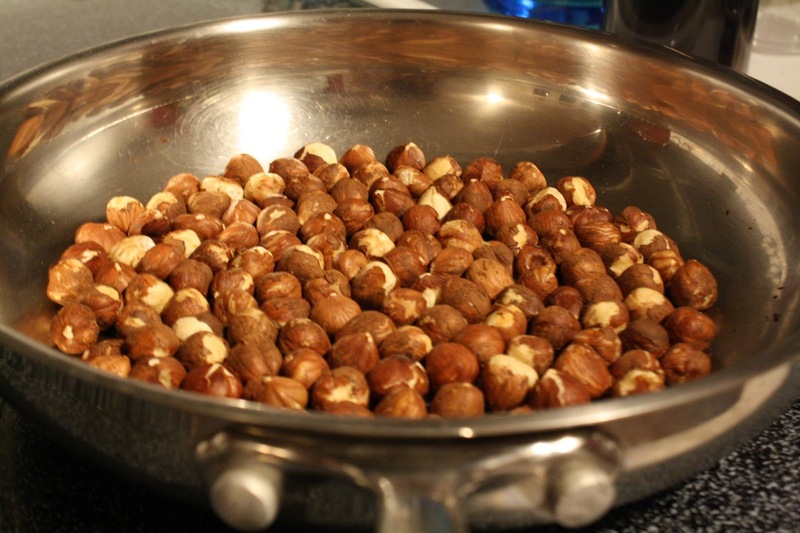 After letting the hazelnuts cool, I removed the skins and coarsely chopped them. 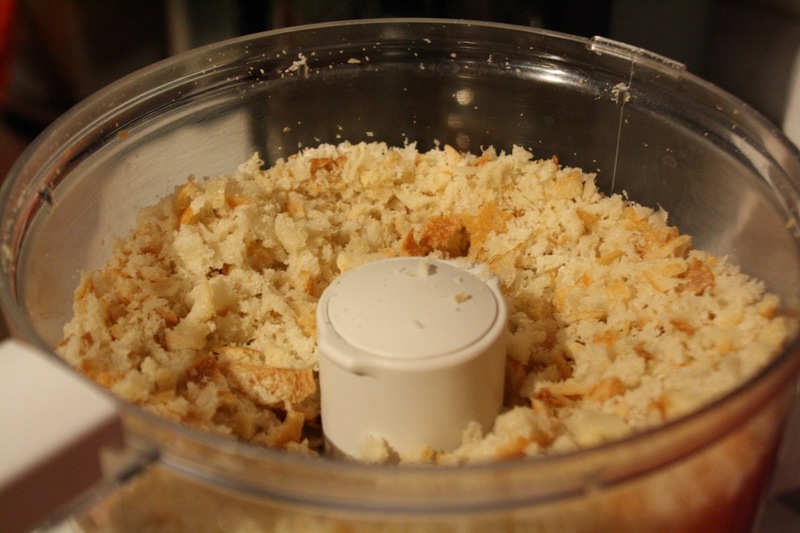 The recipe also calls for breadcrumbs. Not having breadcrumbs on hand, I decided to make my own from leftover bread. Yesterday’s baguette becomes today’s breadcrumbs. Assembling all of the ingredients together, I can tell that this pie will be delicious. Unlike sweet pies made with pumpkin, sweet potato, or butternut squash, the cubed butternut squash and the hazelnuts make this savory pie quite chunky and hearty. After baking, the pies looked perfect. I was very glad that I doubled the recipe — one pie to share with coworkers and one pie to eat at home. If you are still looking for something to cook for your Thanksgiving dinner, consider this recipe for a delicious accompaniment to your ham or turkey.